No one wants to be cynical, but following the debacle with Aliens: Colonial Marines, a bit of added scepticism has settled in. Screenshots and video presentations of Colonial Marines appeared outstanding, yet the playable version that hit retail was a far cry from those promises. 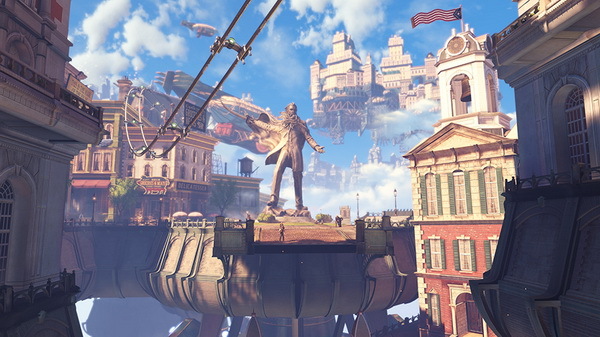 My faith has been restored, as getting a hands-on preview for Bioshock: Infinite has set my worries aside, as the game appears and feels to have lived up to its promises. 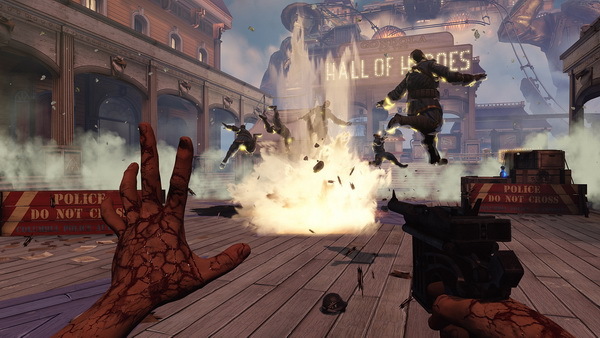 Out the gate, it must be said that Irrational Games should be respected for developing a game that breaks moulds and doesn’t just go for the safe and generic FPS market. 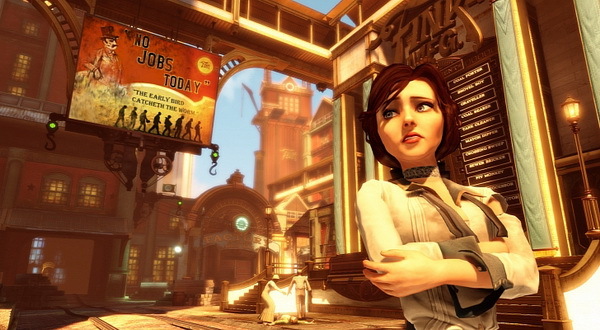 The game world and story is one of the greatest hooks of Bioshock: Infinite, as Bioshock 2 left a bit to be desired. It was a great game, it just lacked the mystery and “aura” that Bioshock 1 had, and left a bit of “been here, done that” kind of feeling. Bioshock: Infinite injects that same air of mystery and secrecy that is a huge driving factor for the narrative of the game. 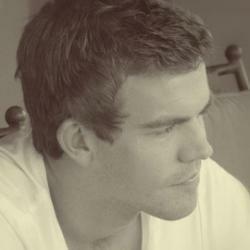 It also pushes the boundaries a bit, as religion and racism feature as sub-plots to the story. The story takes place in 1912 and revolves around a character named Booker DeWitt, a drunken and disgraced former Pinkerton agent, who’s got himself in trouble with the wrong people. Offered a deal to clear his name, DeWitt is tasked with infiltrating Colombia, a flying city which mysteriously disappeared, in order to retrieve a young girl by the name of Elizabeth, who is being held in the city. She is being protected by the Song Bird, a giant Big Daddy-like winged creature that acts as a guardian/warden for Elizabeth. If Booker is able to bring Elizabeth to New York City, he’s a free man; however, it’s not going to go as smoothly as hoped. This is what Bioshock Infinite does so well – it sets the stage brilliantly, as when Booker arrives in Colombia, things appear almost heavenly – children playing in the streets, gorgeous statues and monuments line the walkways, and beautiful gardens round off the edges; but the more Booker ventures into the city, the more cracks he uncovers. You see, we learn Colombia is led by Zachary Hale Comstock, who believes the people of Colombia need to remain “pure” from foreigners or threats. The ugly face of racism, xenophobia and Nazisim become immediately apparent once the fountain and flower-filled façade of Colombia is pulled back. An example of this is early in the game – you’re roped into a faire and handed a baseball, and on-stage appears an interracial couple. You’re then given the decision, with the crowd cheering you on, to throw at the couple or hit the announcer. It’s in these moments that the thematic strength of Bioshock Infinite become apparent. Booker learns that Elizabeth, known as “the lamb”, is the prized possession of the city, and hears the story of a “false shepherd” who will come and take Elizabeth and will mark the downfall of Colombia. Booker strangely features the letters “AD” on his hand, which is considered the sign of the “false shepherd”. The people of Colombia pick up on this pretty quickly and the city goes on lockdown to stop Booker from completing his mission. A revolutionary group, the Vox Populi, is also hiding beneath the face-mask of the city, and things are teetering on the edge of a civil war. 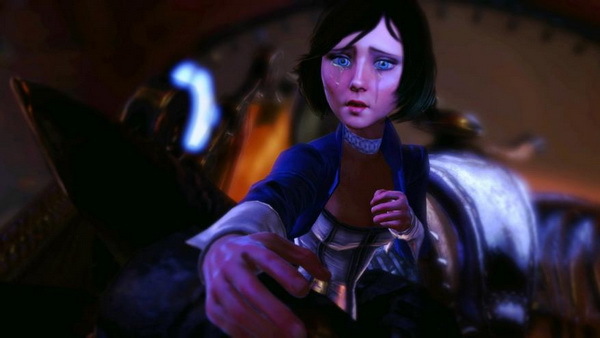 Due to all these elements, Bioshock Infinite doesn’t shy away from the more sensitive adult themes often untouched by other games in the genre. 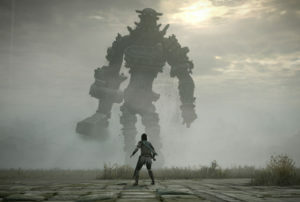 It presents them in a real and often shocking manner, and playing as a talking hero who interacts with the world and other characters makes it that much more interesting and enjoyable to experience. In terms of gameplay, the tried-and-tested Bioshock formula returns, albeit with some new tricks up its sleeve. Instead of plasmids, you have vigors, and instead of eve, you have salt – essentially they act in the exact same way. Vigors give you a number of different powers. The ones I got to try out were Devil’s Kiss (a pyrokinetic ability), Possession (taking control of machines to turn against enemies), Murder of Crows (literally sends crows to murder enemies) and Bucking Bronco (which levitates enemies into the air). There are more vigors, however I wasn’t able to see them in action in the particular demo. The variety of vigors is great, and most Bioshock fans will be wowed by how they all come into play. Another unique item in Booker’s arsenal is the skyhook. The skyhook’s primary function is used for traversal, as there are rollercoaster-like rails weaving throughout the city’s skyline. 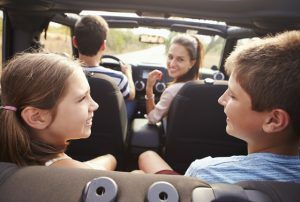 Players can magnetically leap towards skylines at any time when in reach, and go for a ride around, either to get away from danger or into a tactical position. The rails add another element of depth to the gameplay, but beside that, they’re a visual treat when on them, giving you a sense of speed and vertigo that’s fresh to the series. Firearms seem more readily available than in Bioshock 1 or 2, as I got to try out a pistol and machinegun early in the game. 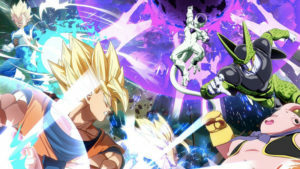 The feel of the weapons is similar to that of previous games, however firefights seem to take more precedent than melee combat, although the melee is a visceral and brutal as ever. 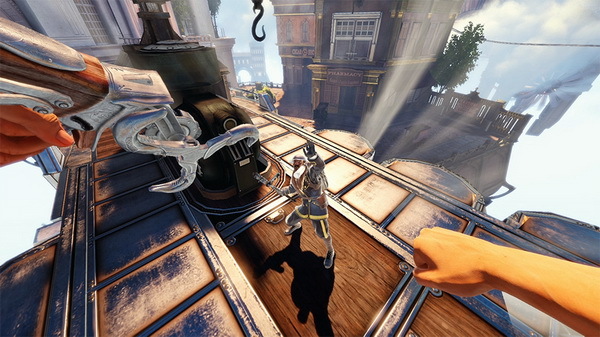 The skyhook (as mentioned earlier) is not only for traversing, as it can also be used for more violent actions. Using the skyhook as your melee weapon, you can bash enemies heads in, and if the opportunity arises, do a finishing move, which could be a face-ripping execution or decaptitation – it’s pretty intense stuff. Elizabeth won’t only be a supporting character, as her role in the game will be integral to your success. Elizabeth hones some incredibly supernatural powers (related to why she’s being held captive), as she can create “tears”, which allow her to pull objects through space and time to appear in Colombia, such as weapons, items or cover. Visually, Colombia is a vastly new direction for the Bioshock franchise. Going from the claustrophobic and leaky corridors of the underwater city of Rapture, to the brightly lit and airy look of Colombia is a great contrast for the series. The playable version was development code, so there were some visual hiccups, but I was assured that the final game has been polished up beautifully. It was evident that the art design and style was fantastic, and will live up to the high aesthetic bar set by fans. 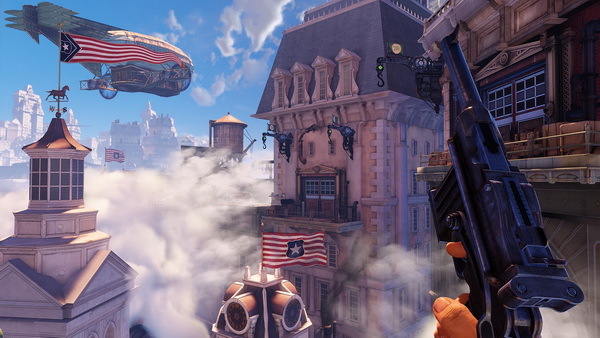 Before the hands-on preview, my feelings towards Bioshock Infinite were mixed – not for any particular reason, maybe it was just fatigue from all the new releases. 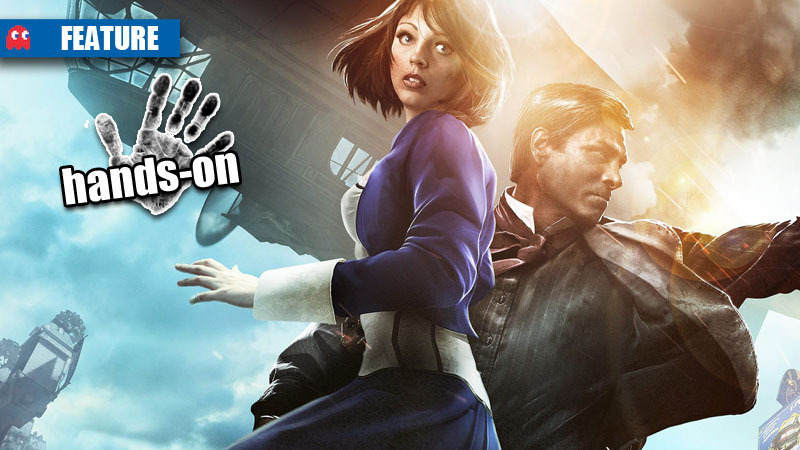 But after getting some time with the game, Irrational have revived my excitement and enthusiasm for Bioshock Infinite, as they truly are creating something that has solid gameplay and gorgeous visuals all wrapped up in a risky, ambitious and genuinely intriguing story – and that’s something rare these days.